At last, Friday, April 12th finally arrived! Now we were excited! With the Odyssey loaded up, on Friday morning, we were ready to leave at 6 a.m.
BUT…..Gizmo had been studying us intently and I guess he decided that perhaps we had plans for him to be part of this expedition so when we did our usual headcount suddenly he was nowhere to be found. Rob had been going in and out of the garage which happens to be one of Gizmo’s favorite places so we were afraid that somehow he snuck out. After searching the house from top to bottom several times, I finally found him in the basement nestled in a corner on the floor hiding next to several tools in Rob’s workshop. GRRRR! Good thing he’s so lovable and cute, otherwise I would have been very mad at him for delaying us by a half hour! Although it was a little later than our planned departure time, we were finally on the road. It was overcast and cold in the high 30’s but luckily no rain yet. 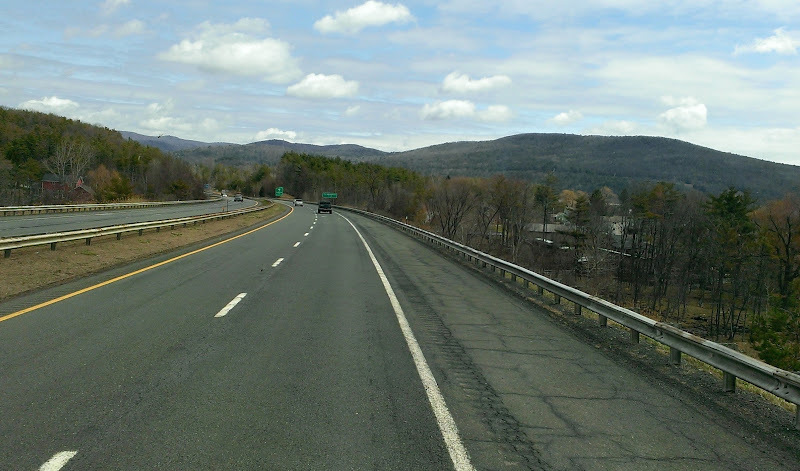 As we drove along the MA Turnpike (90), it was pretty uneventful with no precipitation even at the highest elevations. It wasn’t until we had crossed into New York and about an hour from Albany that it started raining. Rain, not a problem as long as it is not frozen, it’s okay! 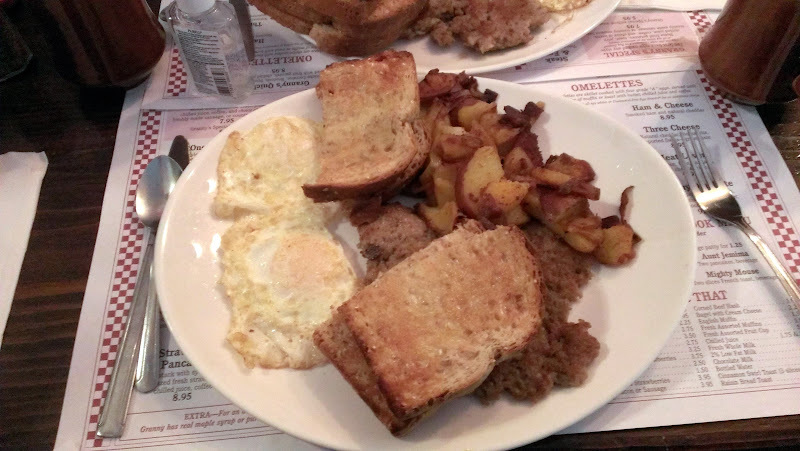 We arrived in the Albany area and since we hadn’t had breakfast yet, we stopped at the East Greenbush Diner for a quick bite to eat. Food was okay, nothing great. We arrived at the dealership a little after 10 a.m. and after handing over the certified check and signing a few more papers, Laura escorted us to the service area where we were introduced to Tim, the prep manager, and Bruce, one of the technicians, who was going to go through the coach with us. 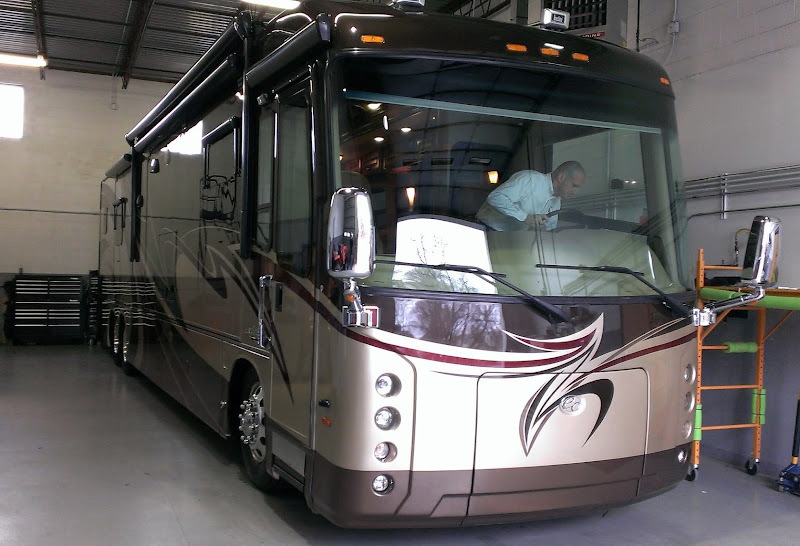 Bruce was good but didn’t seem to have as much in-depth knowledge specific to the Entegra’s as we had hoped – I suppose it’s understandable, they have so many brands and types of RV’s that having intimate knowledge of each and every one must be difficult. The “demo” probably took about 2 to 2 1/2 hours. After that, our coach was moved out to the front of the service area and we were hooked up to electricity. After a quick sandwich, we busied ourselves putting things away, making the bed and exploring. Woo hoo! Rob’s poison ivy arm was still pretty oozy and the gauze bandages he had brought with him weren’t doing the job so we decided to head out to find a CVS for more supplies. Since I hadn’t brought anything for supper (isn’t that convenient), we decided to order take-out online from PF Chang’s China Bistro which wasn’t too far from the dealership and was close to a CVS. Finally we arrived back at our new “home” where we enjoyed our delicious dinner along with a celebratory adult beverage, sitting at the very comfortable dinette watching the 46″ TV with the electric fire blazing and dimmed LED lighting providing wonderful ambiance. WOW, 7th heaven! The multiplex lighting control panels are way cool – most of the lights can be controlled from backlit panels scattered throughout the coach – even right from the bed. Better pinch me so I know I’m not just dreaming that we actually did this! On Saturday morning, at Tim’s recommendation, we went to Grandma’s Pies and Restaurant right down the street from the dealership on Central Ave. Great breakfast – we had their special for $7.95 which included juice, 2 eggs, home fries, bacon, ham or home made sausage, toast and coffee. Service was excellent and the food was delicious. The pies looked really good too, but we resisted the urge. Back at the new coach, we started prepping for departure and hitching the toad and left around 12:30 p.m. And believe it or not, we actually had good weather for our journey home! We even had sun! Whoa! The Aspire drive experience is fantastic, very quiet in the cab, very minimal wind noise and muted road noise. We always thought our Discovery was comfortably quiet up front but the Aspire is a marked improvement – guess the increased density of the Entegra roof/wall/floor insulation really helps! We even have to listen carefully to hear the engine while driving – no kidding! Rob even commented that when standing outside right next to the Cummins ISL in the Aspire it was at least 3 or 4 times quieter than the CAT C7 we had in the Discovery. The Aspire has a tag axle on a Spartan chassis and the stability of the handling is vastly improved as well, although Rob felt the alignment was off a bit plus the steering wheel wasn’t exactly centered – punch list items! Rob loved the visibility afforded by the one piece wrap around windshield. With the cab so far forward and the down sloping dash, we can see the ground much closer to the front of the coach and the low mirrors make sighting rearward much more pleasant – you can see the rear wheels and what’s behind you with the same mirror position. The Discovery had a flat windshield and a flat dash – the dash was a great hangout for the cats but the first bit of ground you could see was 22′ in front of the coach. Also, both rear view mirrors are sighted thru the windshield on the Aspire which is a way big improvement. On the Discovery the left mirror was sighted through the left driver window and Rob always complained about the awful visibility due to the secondary reflections caused by the double pane glass. The rear camera is also a huge improvement and is adjustable up or down with the push of a button – we can adjust it from pointing almost straight down to pointing straight back, which makes it easy to visualize what’s behind you when backing up, not to mention checking out the approaching traffic when moving forward. On the Discovery, the camera was fixed and we could only see from the hitch up to about the top edge of the windshield on the Odyssey – Rob always felt he had a major blind spot while backing up. We realized shortly after we left that we had forgotten to get out our coach EZ Pass so we had to pull over on the side of the road to get that straightened out prior to the first toll booth. The rest of the trip was comfortable and uneventful and the miles quickly passed, it seemed like no time before we arrived at our exit. Since this was the first time driving down our lane and into our driveway, we decided that we would stop in the parking lot of a nearby Holiday Inn to unhitch the toad and I would drive the van home – just in case. With 3 extra feet of coach and the longer wheelbase (not to mention the additional axle) and the same 55 degree wheel cut as the Discovery, our already tight approach was going to be even tighter. Rob wanted me to spot the right rear of the coach as he made the left turn into the driveway to make sure the rear swing wasn’t going to hit a large tree located there. Our road is only one vehicle wide and the coach fills up all of it. Not a problem! He made it into the driveway although he had to stop halfway down so he could move the truck out of the way. It did take a lot more effort turning it around (our poor lawn) due to the longer wheelbase and extra axle and the limited driveway width. Maybe when the dumpster is gone that will get a little easier. Oh, and remember we did all that pruning? Well we still had a few lightweight branches dragging across the roof as we came down the lane – no damage done though! 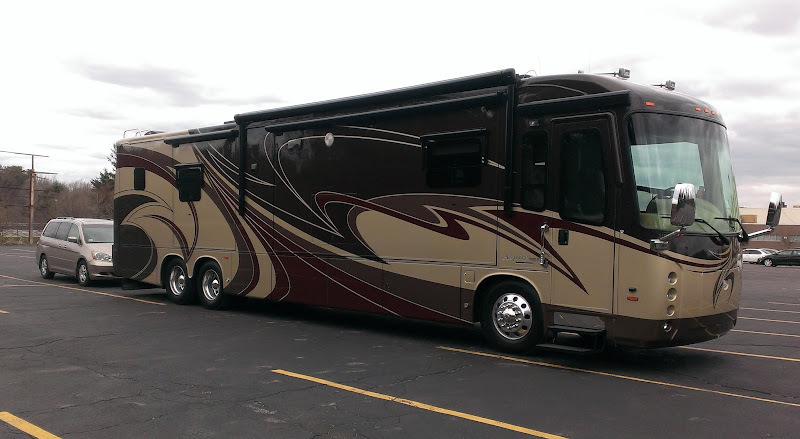 So here we are with our beautiful new “home” in our driveway! One glitch – as I went to unload some of the things we had brought, I discovered that one of the wardrobe pocket doors in the rear bathroom had partially fallen off it’s track. Oh, dear! And those are heavy solid hardwood doors, but luckily no damage was done. One of the locking clips that holds the door to the upper track rollers had somehow worked loose. Speaking of pocket doors, our floorplan has four of them and they are all beautifully crafted. A unique Entegra feature for the pocket doors is an air powered “snubber” under each one that pops up and locks the door in place when the park brake is released – no rattly pin bolts or latches! Once the warranty information is submitted to Entegra by the dealer, we should receive a follow up call from Joyce at Entegra so we’ll tell her about any critical items that need fixing. As we expected and with any new complex machine like this, we continue to find punch list items but most are minor. According to the dealership, Entegra will actually send someone to your home to repair things. And by all accounts the customer service provided by Entegra is second to none (including Tiffin). We’ll see. As an added benefit, Entegra also offers a week long Post Delivery Inspection (PDI) anytime during the 2 year bumper to bumper warranty period back at the factory in Middlebury, IN to address punch list items and any other concerns. During the PDI they will also re-educate you in regard to all the systems on board and install any newly developed upgrades and make other improvements – we figure we’ll compile a list of all the booboo’s we find over the summer and make the trip out to Indiana again this fall. Our focus for the next few weeks will be to finish getting the house ready, so we won’t be spending a lot of time on the bus, although I guess we will have to move the stack of motor home boxes which are cluttering up our garage and basement out of the house and start loading everything aboard. Can’t wait to hit the trails again! Perhaps a quick trip to Maine for a week or two in June is on the horizon but we’ll have to see how things work out over the next few weeks! Also, its boat launching time! I so enjoy the continuing saga and look forward to the next installment. Loved the shot of Gizmo. Coach & Van look enormous. Nice shot in your driveway. The sun shot even better and she looks much bigger. Wow! what a beauty. Can I come live with you. Our Congrats!! Wow! What a beauty! Loved seeing pictures of the inside…we could have used that fireplace this week here in Alabama. So excited for you. Congratulations! Just love your updates and the escapades of one or all of your “kids”. So enchanting. Sounds like your new traveling home is right on. Enjoy and congratulations. P.S. Where’s the dishwasher? I’m still considering one for our RV. Wow, just going to have to come to Boston again and try this one out! In NYC at at moment, shame I cant get to see it now.